Aloe Vera juices have gained popularity worldwide during the last few years. Aloe Vera has been a traditional remedy for burns and cuts for ages, and has regained traction in recent times. They key to its rising popularity is the increasing awareness about its various health benefits. Aloe Vera juices are rich in several nutrients like Calcium, Potassium, Manganese, Zinc, Vitamin A, B, C and E. Consumption of Aloe Vera juice improves digestion and the immunity system, and helps detoxify the body’s systems. It is also touted to help in weight loss. This makes these juices a good health supplement and alternative to other chemically processed beverages. Increasing consciousness of people across the globe towards health and fitness has made Aloe Vera juice a favorable option. This has driven its demand in recent years. Further, the medicinal properties of Aloe Vera make it useful for patients of diabetes, high cholesterol, cardiovascular and digestion problems. This further gives a boost to demand for Aloe Vera juice. The Food and Beverages Industry is developing rapidly and hybrid drinks with aloe Vera juice are being sold. Such drinks are gaining wide favorability among consumers and further driving the Aloe Vera juice industry. Currently more than half of the global population (54%) resides in urban areas. The rising urban population further contributes to demand as urban population is more health conscious. The Aloe Vera Juice Market was valued at USD 0.84 billion in 2016. It is expected to grow at a CAGR of about 11% over the forecast period and reach a size of USD 2.15 billion by 2024. Aloe Vera juice has the highest demand among all other aloe vera products and is expected to grow rapidly. Flavored juices account for majority of the market share in terms of revenue. This can be attributed to their non-complex nature and wide availability. Geographically, the market in the Asia Pacific region is expected to witness the highest CAGR during the forecast period. The rising geriatric population is concentrated in this region. Economic development has increased the urban population and personal disposable incomes. As per UN data, 55% of the global urban population in 2014 was residing in this region. By 2018, more than 50% of the region will become urban. India, China and Nigeria are expected to contribute 37% of the projected urban population growth. This will give rise to consumerism and expand the market for Aloe Vera juice in the region, with popularity among the health consciousness urban dwellers. 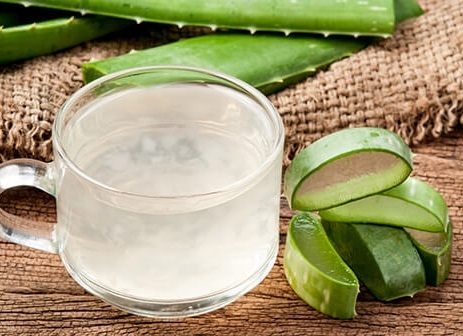 Additionally, health issues like cholesterol and diabetes have also risen, further propelling the growth of aloe vera juice market in the region. The demand for aloe vera juice is majorly driven by increasing inclination of consumers towards healthy beverages as alternatives to carbonated drinks and chemically synthesized fruit juices. High mineral content of these juices provide wide ranging health benefits and help tackle various problems like high cholesterol, diabetes, cardiovascular and digestion related problems, mineral deficiencies and skin ailments. Additionally, they help in detoxification, building the immunity system and weight management. Such factors increase the popularity of Aloe Vera juice among consumers and give a spur to demand. Aloe Vera juices are easily available at drugstores and supermarkets in urban areas, and are also available online at considerably affordable prices. The easy availability and cost effectiveness also act as factors that bolster the market. Incidences of adulteration in the juices decrease consumer confidence and hamper demand. Consumers tend to incline towards premium brands. However, high cost of these premium brands further dampens the market. Governmental regulations regarding food and drug safety might further act as challenges for players. Keeping in mind the rising health consciousness and importance given by consumers to the taste of the product, players are coming up with hybrid juices. These hybrid juices contain other fruit juices as well, apart from Aloe Vera, making them an excellent choice which is both healthy and tasty. Players are also adopting marketing strategies that involve advertising the health benefits of Aloe Vera juice extensively, in order to capture the health sentiment in the current market. MSG All Trading International Pvt. Ltd.
8.2.12. Nature's Essence Pvt. Ltd.
8.2.14. MSG All Trading International Pvt. Ltd.
8.2.15. Bright Lifecare Pvt. Ltd.
8.2.16. Rattan Organic Foods Pvt. Ltd.